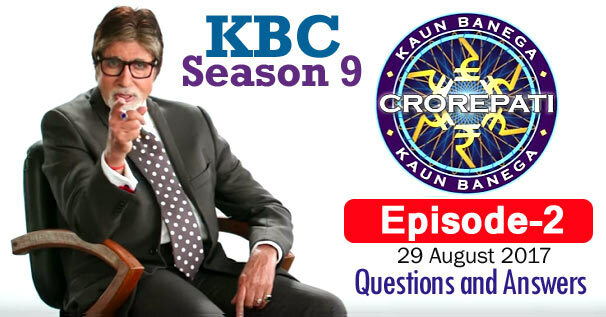 KBC Season 9 Episode 2 Questions and Answers: The second episode of Season 9 of Kaun Banega Crorepati (KBC) was telecast on 29th August 2017. In which Amitabh Bachchan had asked contestants 16 questions of General Knowledge. The correct answer to all the questions is given below each question. By reading these questions, you can prepare yourself for the next KBC Season 10 of Kaun Banega Crorepati. Because by reading these questions, you will understand what kind of questions asks Amitabh Bachchan in KBC. These all general knowledge questions will be helpful to for you various Competitive Examinations and Interviews besides KBC. Remember, the answer to some question may be in accordance with that time, while the answer to those question may differ according to the present time. 11. In which of the following social networking site you can 'un-friend' anyone? 12. Identify the character by listening the audio clip..
13. According to Hindu Mythology, Narada is depicted carrying which musical instrument? 14. RTGS, NEFT and IMPS pertain to which activity? 15. According to believe, who among the following is identified as "Chechak Ki Devi"? 16. Which image appears on the flip side of the new 2000 Rs Note, launched in 2016?